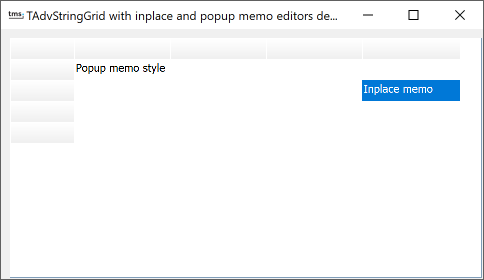 As it was much requested to have a cell inplace editor that has vertical and horizontal scrollbars, this sample application shows how the MemoEditLink component can be used to attach a TMemo control as inplace editor in TAdvStringGrid. For more in detail information on how to use custom inplace editors in TAdvStringGrid, we refer to the discussion of sample application 24. So, with dropping the right components on the form and writing just a few lines of code, an inplace memo editor can be used that features scrollbars.